Damage to consumer confidence can haunt you for a very long time. Windows Vista is the classic case. In case you’ve been locked up in a wardrobe for the last two months, Windows 8 is on the way. At the launch a few weeks ago, they demonstrated how the next version of their operating system is designed to work in tablets. 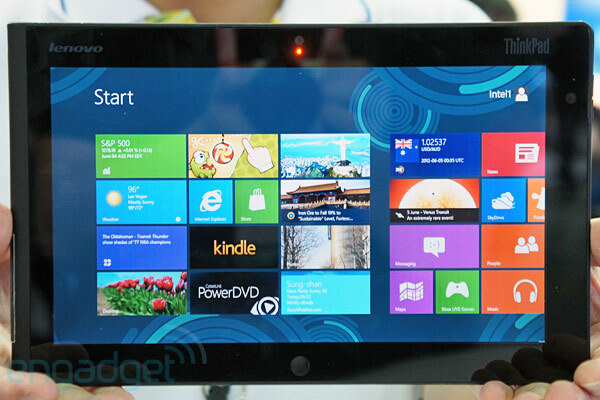 The fact that Microsoft is focusing on tablets is interesting, because it shows how high the stakes are. For over a decade, bar a few niche markets (Macs for high-end users and graphic designers, Linux for the tech-savvy), Microsoft has been the undisputed king of Desktop PCs, and none of Microsoft’s competitors are anywhere near taking their crown. The problem is: they don’t have to. The computing market is moving on. Many things that used to be done on a Windows XP machine can now be done on a smartphone or a tablet, and consequently, many Desktop PC users are switching to these devices. And so far, both tablet and smartphones are dominated by Apple and Android. The nightmare scenario is that Android makes the leap from tablet PCs to the desktop and undercuts Microsoft’s safest market. Little wonder Microsoft wants Windows 8 established on touchscreen computers so badly. It should not have been this way. Tablet devices such as the iPad are really just laptops with touchscreens instead of keyboard, so Windows ought to have had an easy transition from one to the other. Instead, tablets are being treated as oversized mobile phones, and Apple and Android, both miles ahead of poor old Windows Phone 7 in the market share, got there first. The thing is, Windows Phone 7 actually got a fairly good reception on its launch, and Windows 7 on the desktop didn’t do too badly either, so what is going wrong in the touchscreen market? Lack of attention to hardware compatibility. In the days of Windows XP, Microsoft could get away with expecting manufactures to get their hardware compatible with Windows (on pain of going out of business). When Windows Vista came along, suddenly Microsoft had to do it the other way round, and evidently didn’t realise the amount of work involved. Too much trust in the upgrade facility from Windows XP. Upgrading an operating system has never been that reliable, and whilst there was no harm in providing the facility for those people who understood and accepted the risks, it was a big mismanagement of expectations to present this to Joe Public as the quick and easy way of moving from XP to Vista. Underestimating the implications of a five-year gap between releases. Between the release of XP in 2001 and the release of Vista in 2006, we saw the widespread adoption of home broadband, wi-fi, CD writing, digital cameras, MP3 music, online financial transactions and – unfortunately – a whole load of security threats abusing these technologies. All of these were accommodated in Windows XP with one sticking plaster after another. Incorporating all of these into a consolidated modern system was inevitably going to take a long time to get right. Over-dependence on high-spec systems. Microsoft products had been criticised before for getting more bloated as computers got faster, but Windows Vista took this to a whole new level, with even new computers pre-installed with it struggling to meet the system demands. Some performance testing on lower-spec machines should have set alarm bells ringing much sooner. Lack of caution with digital rights management. It’s not fair to blame DRM on Microsoft completely, because they were leaned on by the big film companies (who, let’s be fair, had their sources of revenue to worry about). But when you introduce a feature that’s designed to restrict what you can do rather than enhance it, the last thing you want to do is end up also stopping users doing perfectly legitimate thing. DRM was always going to be controversial, but giving the impression that faults elsewhere in the system was a price worth paying was really asking for trouble. I could be wrong; for all I know, it was a different set of mistakes. But there was a little doubt of the result: Windows Vista needlessly reinforced Microsoft’s reputation as the unreliable software we all love to hate. Windows stayed king of the desktop PC for one reason and one reason only, being that most people considered switching to the alternatives too much work or too expensive. And in the smartphone and tablet market, where Microsoft doesn’t dominant, that’s not good enough. The moral of the story is that even after you correct your mistakes (as Microsoft largely did with Windows 7), the damage to your reputation can haunt you for a very long time. Microsoft will survive somehow. We saw with the Xbox that Microsoft can still compete, and we saw with the Kinect that Microsoft can still innovate. Microsoft has doing better in the server market than it used to. Even if the apocalyptic predictions of the demise of the Desktop PC come true, Microsoft has deep enough pockets to hold out until they find a new role in the IT market. But when we are even contemplating this of a company that once wowed the world with Windows 95, something has gone seriously wrong, and the rest of the world needs to learn lessons from this.